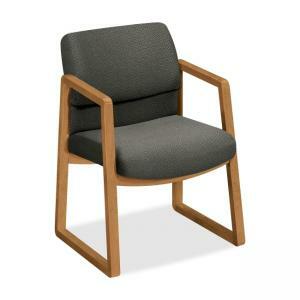 Sled-base guest chair offers solid construction for lasting performance and fully-upholstered outer back. Special lower lumbar area provides proper support for a natural sitting position. 20" wide x 19" seat is made of 1/2" thick, five-ply curved plywood and a 3-1/2" urethane foam cushion. Back measures 19-3/4" wide x 16" high. Distance between arms is 19-1/2". Design offers select hardwood square arms, frames and base caps. 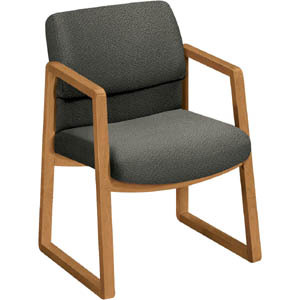 Chair is certified by SCS to be in compliance with specific indoor air quality emission requirements and meets or exceeds applicable ANSI/BIFMA standards.